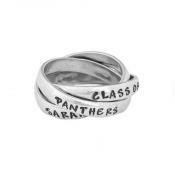 "Personalized Class Ring Silver, Hand Stamped Double Ring"
Looking for the perfect personalized class ring? The simple and sophisticated Personalized Class Ring will be the perfect gift for any stylish grad. 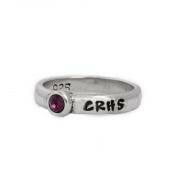 Create a personalized class ring by stamping a name, school, class year, mascot, graduation date ~ anything you want! All silver is sterling and the bands are approximately 3mm wide. Double band ring is stamped with up to 12 characters per band. 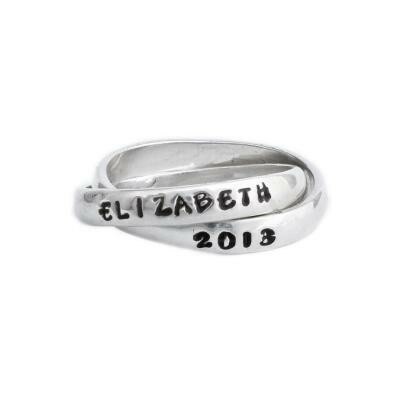 Congratulate the graduate with a one of a kind personalized class ring! Typical graduation rings can be too bulky for many. This simple and sophisticated design is perfect for the stylish grad. You can design your own ring and we will stamp their name, school, greek affiliation, class year, mascot or anything that will commemorate their high school or college years on this customized sterling silver double class ring. Dimensions: The sterling silver bands are approx 3mm wide and can be stamped with up to 12 characters/spaces. Please note the bands are interconnected and will alwasy move around. The same band will not always be on top. Prices include stamping. Because this item is customized all sales are final.